Really it is heartbreaking when your dog can’t move out for walks because of old age, injury, or other similar reasons and you feel very helpless when he won’t be able to accompany you on a walk to the park or open areas. Using the best dog stroller is the real solution when your furry friend gets older and might need a simple help to move around. Dog stroller makes it easier whether you need to meet the emergency with the vet or to join an outdoor event or experience in fresh air to get rid of physical challenges. It provides your dog a safe and familiar place to get rest and makes a barrier to protect from aggressive animals. Here, after a deep research on more than 100 items, consult with two vets and several famous pet stroller manufacturers decided to review 25 dog strollers to make your pet safe and happy. So, take your time to analyze the information set out below and choose the best one for your four-legged friend considering price, durability, functionality and comfort level of the product. 5 Which Criteria Determines the Best Dog Strollers? The Pet Gear No-Zip NV is the stroller has plenty of features to influence your purchase. It comes with no-zipper latch which allows easy locking by skipping the burden of the zip fastenings. The front locking wheel with safety brakes allows the stroller to navigate over rough terrain without shaking more. The stroller has a larger interior with the panoramic view window which allows your pet to enjoy any sights along the way. The elevated paw rest of the stroller assists your pooch to travel in style and comfort. It is easy to fold the stroller by one hand when required. The stroller also features 12-inch air ride tires which move by easy pushing and make the ride smoother. It also comes with new stylish colors and embroidery weather cover and a plush pad for your pup. 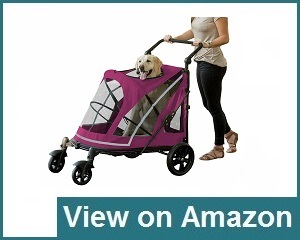 You can additionally purchase a divider to use the stroller for double pets separately. The addition of a rain cover and foldable hood makes the stroller amazing for every type of weather. You won’t face any problems to carry your pooch with this stroller, rather the inner space allowing your dog to gratify its curiosity and feel a part of the world you carry him to discover. For dogs who love an extra smooth ride, the Pet Gear No-Zip Jogger Pet Stroller is perfect. NO-ZIP technology reduces hassle when trying to open or close the stroller. It also assists to gain easy access to your pet without applying force with tough zippers. 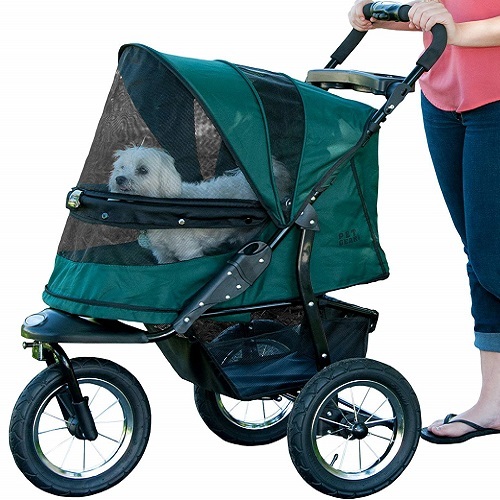 The stroller features complete with a large panoramic view window to allow your dog easy look out of the outer scenery while moving. It comes with an elevated paw rest to ensure better support and highest comfort for the long run. The 12-inch quick-release Air Ride tires make the ride smooth and comfortable over almost any terrain for your pup. You can also lock the front wheel to provide to control the speed and provide a bit more stability during walking or jogging. The large undercarriage carrier allows bringing all essentials of your pup when going for a day out with your dog. The fabric is water resistant 600 Denier material keep you tension free about your pup when you run in the rain or pass through the snow. If you are looking for a pet stroller within the best budget, consider the Paws & Pals City N Stride which is suitable for both dogs and cats. 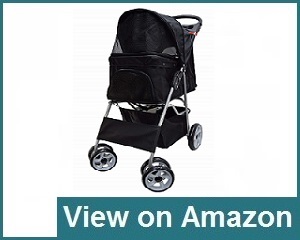 It is the best-selling stroller for small pets and ideal for short strolls on a smooth surface. The people who live in the city like most this carrier to take their dog for a walk in the open air. This high-quality lightweight stroller weighs up to 12 pounds and measures 40.9 by 47.2 by 23.2 inches. This stroller is made of a combination of aluminum, rubber, plastic, and nylon. These materials make it lightweight and facilitate to move easily at different places for a user-friendly experience. It also features with a retractable waterproof rain hood that keeps the rain or the sun away from your pet. With the retracted hood, you can get the facility to pull off the covering and allow your dog to enjoy the fresh air and sunshine. The seat belt leash and rear security brakes of the stroller keep your dog safe and secure while strolling. The stroller is also designed with 4 wheels which make sure it will remain balanced and enhance for a smooth rapid walk without any fear of balancing with your pooch. The spacious design offers maximum movement inside the stroller so that your dog won’t feel confined in the carriage space. Your dog can make a full circle, lie down, sit up and roll around if necessary. The VIVO Pet Stroller is suitable for small pets those are weighing up to 30 pounds and it allows keeping the dog rolling with its ample room. The huge shielding partition has different access points which are zipper protected. The large windows provide enough ventilation and breathability which keeps pets happy and relaxed. This four-wheel pet stroller includes three zipper access terminals to easily get in and out. The 19” x 12” x 19” spacious interior with padded foam provide extra comfort to stay inside the stroller. The attached cart is completely collapsible activated by two latches from the side of the stroller. The pushing handle is covered by soft padding and allows pet proprietors to push effortlessly. A flexible screen of the stroller provides your dog the opportunity to interact with their surroundings when you cover out the top canopy to allowing sunshine. The mesh windows afford plenty of visibility and the cup holder with undercarriage storage ensures everything you need on the longer run. It works great for pets which is suffered from mobility issues due to arthritis or joint problems. You will be totally free from caring anything around during jogging time. Otherwise, the stroller is also lightweight and easy to push. You don’t have to worry about the safety issue of the stroller. There are two locks attached on the back wheels to enhance security by controlling speed. The VIVO Three Wheel Pet Stroller provides first-class travel for small to medium sized dogs. This is lightweight and easy to take your pet when you decide to go out and it also protects your pet from outside elements. The stroller helps you to carry your pet easily when you stay in the shopping mall or other bounded locations. Structurally it is easy to open and fold with just a few clicks and locks the body when necessary. It comes with two rear wheels and offers easy push-down brakes with just your foot to control the speed of the stroller. The other front wheel is designed with the same sturdy plastic and rubber material like the rear. The body of the stroller structured with a lightweight aluminum frame and the bottom made with high-quality foam which is machine washable. The mesh front cover can be added or removed by using the zipper. Without the mesh, your dog can see the surroundings while strolling but the mesh allows the dog breathing freely and ensure the highest comfort inside the stroller. The interior space measuring 19 inches x 12 inches x 19 inches makes a huge container for small and medium dogs where you can reserve your pet essentials. The three-wheel stroller also offers a retractable canopy to save your pet from direct sunlight or heavy rain. So, consider this stroller as a great carrier for your pet’s moving and choose anyone from various colors and design. If you are looking for a pet stroller for your small pets, The Paws & Pals City Walk N Stride 4 Wheeler Pet Stroller would be the perfect choice for both you and your pet. 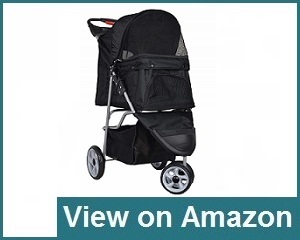 It is the best-selling stroller suitable for short walks on the smooth paved pathways. Basically, the city living people who want to carry their dogs for regular exercise or for a walk and enjoy the open area. The interior area measures 40.9 by 47.2 by 23.2 inches and weighs around 12 pounds. The stroller also features undercarriage storage to bring all the knick-knacks for the dog’s safety and comfort. This stroller is made with the combination of aluminum, rubber, plastic and nylon materials which make it lightweight and offers to move easily from one place to other. The used plastic wheels are eligible for cushioning the stroller through the semi-rough pavement. The 4-wheel model provides you the facility of taking any types of bumps and uneven roads to make a smooth ride for your dog. So, definitely, it offers sufficient comfort for dogs while moving for outdoor activities. This 3 Wheels Pet Stroller made of original plastic material which is smooth and enough strong to last long time. The durable mesh provides adequate airflow and allows your pet to enjoy the scenario of the roadside. The large 6.3 inches wheels run easily over rough terrain without shaking. The front wheels rotate at full 360° angle and facilitate to turn on the straight walk to attain mobile lifestyle. It features strong fiber zipper to zip and unzip easily with quick collapsible convenient storage. The large undercarriage facility allows keeping your pet’s all essentials like treats, water bottles, toys, etc. It can hold two small dogs are weighing up to 30lbs. The manufacturer company will gladly give you a 100% refund for any dissatisfaction. 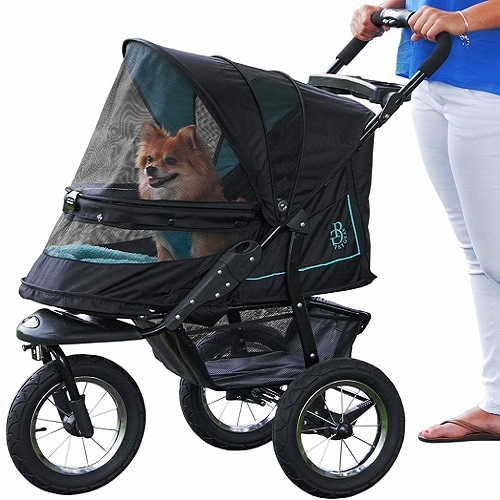 So having this stroller lets you caring your pets together for an extended journey. 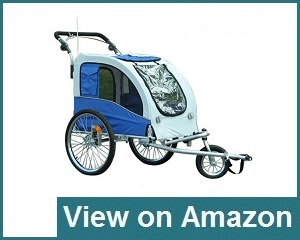 Pet Gear No-Zip Stroller comes with many new exciting features. It is the most suitable stroller for large dogs offers a spacious and comfortable ride for multiple dogs. The no-zip features the latest innovative modification and replaces the zipper system with an easy-lock latch system to open and close. The stroller comes with two easy-locking doors and allows the pet to load and unload from both front and back of the stroller. It can run with bigger sized dogs weighing up to 90lbs. A multi-positioning handle helps for easy pushing the stroller even in single hand. The large wheels support smooth riding over all terrain like zig-zag, rough or semi-semi rough. The mesh window of the back side allows for a panoramic view of the surroundings. Aosom is the quality trailer dog stroller made of the adjustable handlebar for different heights. It is a cost-effective stroller very effective for jogging and running on pavement or free area. The pocketed seat ensures more safety during strolling. There are no additional tools required to set up or break down. The front wheel can swivel while riding but you can also be fixed if decide to go for jogging. It can hold up to 88 pounds means can carry large dogs. The interior of the canopy is 30.5 x 23.5 x 21.5 inches and your pet get a huge place where it can lie down comfortably and enjoy the journey. The frame of the stroller is made with strong and durable lightweight steel which makes the stroller very sturdy and comfortable to ride for large dogs or multiple smaller dogs. Pet Gear Happy Pet Stroller is a stylish and eye-catching carrier to make fun or travel to the dog park. The mesh windows keep insects away from the dog and deliver cool ventilation weather. It has a removable weather guard, waterproof interior pad, large storage basket, rear brakes, and shock absorbers to ensure a smooth and comfortable ride. It takes only 5 seconds to fold up for useful storage anywhere. The interior measurement is 24 x 12 x 23 inches and 37 x 8 x 15 inches on the outside. This happy trial pet stroller offers your pet a safe and comfortable ride. The front swivel wheel and easy pushing features influence you to spend quality time together. A safety tether has been attached to the cabin allows you to clip your pet’s collar or harness. It is available in Cobalt Blue, Pink Ice, and Tan / Brown. Deluxe folding four-wheel pet strollers are amazing in quality provides a smooth and pleasant ride for both pet and pet proprietor. The durable mesh offers sufficient ventilation for fresh air and a removable soft pad for extreme comfort inside the stroller. It has plenty of storage places and you can carry different necessary elements to make the traveling more colorful. 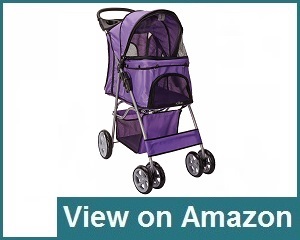 The built-in leash enhances the safety level and large wheels ensure smooth strolling. If you want a durable, sturdy, safe, and comfortable stroller for your pet, OxGord Double Dog Stroller is one of the most quality strollers for you. It features a quality zipper for easy access and multiple mesh screens for adequate air circulation. You can bring your loving pet for a walk on the pavement or inside the park at your leisure. This pet stroller also equipped with a holder to carry out toys, foods, treats or snakes while strolling. The Pet Gear Happy Trails stroller offers great visibility to your pet from the stroller and allows observing total area surrounding them while moving on. It is appropriate for sidewalks on the pavement, but you need to add large wheels when you want to travel on high grass surface on the park or garden. The stroller can hold up to 40Ibs and you can carry two small dogs together. Pet gear no-zip special edition pet stroller is a new addition to NO-ZIP technology helps you to open and close the stroller without using the zipper. 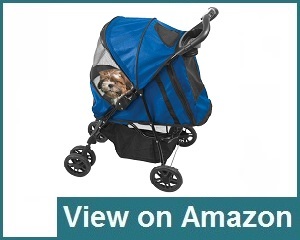 This stroller features an elevated paw rest and a front bar so that the dog can simply observe the outside of the stroller. The new panoramic view of pet gear stroller keeps your pet safe, and secure without missing any scenario while strolling. The approximate measurement of the interior area is 25.5 inch L x 12 inch W x 20.5 inch H.
Obviously, you will love this pet stroller for a very stylish design with three new looks. It has large protective spaces to carry your pet safe while strolling on. Additional thick fleece pad provides extreme comfort and the storage basket allows keeping pets extras. It is simple to manage for its easy one-hand fold mechanism. Dog proprietors appreciate this Pet Gear Ultra Lite Travel Stroller for its lightweight, excellent assembling facilities, and portability. It provides optimum safety and protection to your pet wherever you travel. Large 6-inch wheels offer a smooth strolling without any hassle in the rough surface. It has the quick-fold mechanism and waterproof tray for easy cleaning. When your dog is much older and not safe for jogging or walk, the Pet Gear Roadster Pet Stroller is the best option for you. It is designed with a large protective pet compartment, ergonomic handle, sturdy frame, and front entry. It also equipped with the waterproof floor for easy cleaning, the front swivel wheels for smooth strolling, rear brakes for maximum safety and bug proof mesh for sufficient air circulation. If you need a quality dog jogging stroller within the affordable price range, Best Choice Products 2 in 1 Pet Dog Bicycle Trailer Stroller is the best selection for you. It features durable 3-wheel with terrain tires and manual handbrake to control any type of outing while strolling. This lightweight, strong steel frame can support up to 66Ibs. You can set the adjustable handle in a comfortable height as your own convenient while running. Blue dog stroller is very decent quality and cost considering pet stroller sustain year after year without any trouble. Included cup holders and large storage basket allow treats, water bottles, and other essentials during strolling. Comfortable pad and durable mesh provide adequate air circulation, visibility, and enjoyment. This pet stroller can afford up to 45 pounds. Pet Gear Sportster Pet Strollers offer a fantastic way to take your pet on the long walk or other outdoor activities. It is easy to celebrate smooth riding and put up or down quickly. The stroller has the waterproof interior pad, front locking swivel wheels, and rear brakes. It is Ideal for dogs weighing up to 45Ibs. Serpentine 2-In-1 Pet Bike Trailer Stroller for dog parents who wants to enjoy walks runs, bike rides with his pet. This dog stroller transforms easily and quickly to make you happy at any adventure. Designed by safety leash so that your dog can’t jump out from the stroller and rear access doors with mesh windows allow adequate airflow. 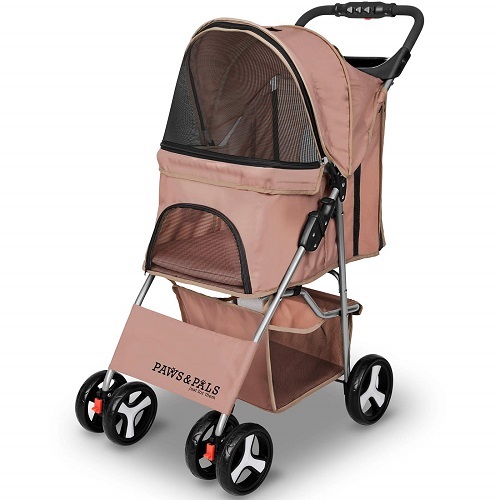 Gen7Pets Regal Plus Pet Stroller is the ideal combination of flexibility and style. It can hold up to 25 pounds and offers numerous conveniences. The front wheel swivels smooth riding on rough surfaces and available extra pouches are suitable to store some emergency and necessary items for both of you and your pet. A soft and smart pad is included which is easy to clean and provide extreme comfort. If you are badly interested in a new stylish designed dog stroller, BestPet Plaid Posh is highly suggested for you. It is designed with colorful plaid fabric and a rear wide window on the front and top of the dog stroller for optimal air circulation and visibility. A snug carrier offers to carry necessary foods or treat to make the ride more happy and comfortable. The Dogger Dog Stroller has been designed considering most senior dogs to provide the most comfortable and happy ride. You can move anywhere with this stroller like beaches, pavements, parks, shopping malls or long walks. This stroller designed with real rear suspensions to ensure the highest comfort. The basket sits allow your pet to have the best view available in surroundings. A good dog stroller allows you to carry your dog almost any venues like the vet, shopping malls, restaurants, concerts, or open places and can keep him in your full control. The stroller not only keeps your pet safe, but it is also designed to provide your dog with enough space to move them around with comfort. Eventually, pet stroller can be an excellent choice for those wanting safe transport protection for their dog. With increasing dog’s age, it becomes tough for them to exercise regularly and successfully. As a result, they get tired faster and can’t effort much out of their walks. If you want to bring your dog with you for outdoor activities, using a stroller helps your dog to provide a place to take rest when it gets too tired. In this way, you can enrich your dog’s regular life with joy and happiness. Whether you like to jog over long distances with your small pooch, it may difficult for them keeping up with you. To face this issue you can get help from a tiny pup stroller which is accurately sized for your little friend’s relaxation. Otherwise, traveling by different vehicle like a car, boat or flight becomes stress less with a dog stroller. If your pet gets sick or suffers from injury, they lost their usual energetic levels. A dog stroller can be of immense use in this type of emergency situations where your pet gets injured. Best suited strollers can give pet proprietors the peace of mind so that they can remain cool in their dog’s an emergency situation. In case of long run or outdoor walking, strollers often use for protecting the paws of your dogs those are vulnerable to the hot pavements. Sometimes it becomes needed to your pooch receiving fresh air to overcome monogamy. Moreover, dogs which have recently suffered or injured through surgery also required to move on open air for mental comfort. To tackle these conditions Pet proprietor can’t think any alternative without dog stroller. With a stroller, definitely, it is easy to carry your dog out on a casual outing each day without having any sort difficulty for him/her. There is a common misconception that, some pet owners are opposed to the idea of using pet stroller. They don’t believe in any benefit of pet stroller and think it is a waste of money. Actually, it is wrong thinking that should be avoided if you want to spend a most enjoyable time with your pooch. Which Criteria Determines the Best Dog Strollers? It is the most important factor pet proprietors should consider before finalizing a stroller for their pet. If you have more than one pet and you want to carry make sure the size of the stroller where your pets can stay comfortably and enjoy their strolling. You should also consider the height of your dog and if it is still growing, make a rough estimation of its full grown size for the long run using. There are some pet strollers are designed for small dogs, while some are special to take on more pets. It is another important consideration which allows your pet to grow into the stroller. Pet owners desire to get a stroller that your pup can move easily and get the best effort in long run use. Most of the strollers are designed for small pups but if your pet is at the larger end of the weight limit, you should collect the stroller is larger in size where the pet can stand, sit and turn around comfortably. The common feature of the best dog stroller is these are lightweight but enough sturdy. The best dog stroller maintains built-in safety features to ensure optimum security while the dog traveling in a stroller. Dog owners like to use the stroller at all the places when realizing how convenient to carry their pet through this career. They should have safety seat belts, harness clips, easy-lock brakes on two or three wheels. The used fabric should be soft and durable which acts as a protectant from others and keep hidden from view. The best dog strollers are foldable and suitable for transporting inside the car or other vehicles. They give you a wide range of space to walk and also make storage much easier. Majority of the quality dog strollers allow you to fold and unfold easily. They become lightweight and allow you to transport virtually anywhere. Sometimes the folding mechanism could not work the same for all strollers. Some models work in one push of a button while others require more steps but obviously, you consider the stroller which folds and assemble quickly. It is another big issue you should definitely check out. Normally dog strollers come with 4 wheels or 3 wheels but we prefer you an additional rear locking wheel for enhanced safety of the dogs. Mainly, locking wheels act as a brake and allows you to control speed when necessary. Moreover, you can engage the brakes with your foot to prevent rolling down the hill. You can also find air tier wheels for easier transport around rocky areas. There are different types of dog strollers available in the market depending on the particular requirements of the dogs and here we have highlighted some of them. These are perfect for riding the smaller dog breeds. They keep safe inside of the stroller during riding and feel very much comfortable. These are the nature of baby strollers which allow dogs to enjoy the journey and encourage going outside with their proprietor. Large pet strollers are bigger in size to accommodate large sized dogs weighing over 70lbs. Sometimes pet proprietors carry multiple small and medium-sized dogs together. Inside the large space, your dog can move freely like can make a full circle, lie down, and sit up if necessary. Basically, these strollers come with three or four large wheels and able to run bumpy terrains. These come with additional shock absorbers to tackle your pooch from bouncing around inside the sitting area. Both small and larger breeds feel comfortable to ride this stroller. These strollers offer a wide range of safety and versatility. Usually, they come with three-in-one functionality and offer flexibility, large weight capability with large accommodation. You can separate the dog car seat from the stroller and add when needed. Here we have categorized all dog strollers in four types based on their functionality. Now it’s your time to choose the most suitable one regarding your dog’s size, breed and behavior. Sometimes you feel to carry your dog at the shopping mall, park, sea-beach, or other where you like most to visit. In this case, a stroller becomes very helpful for transporting your pooch. It dismisses the strain of pets and releases pet owners from the thinking of their safety. When a dog becomes aged, it would difficult for him/her walking more. A stroller can help them by riding when they run out of steam. Dogs, those are injured or recovering from surgery may feel relax to get this option for moving one place to another. Dog stroller keeps your dog’s paws away from the floor and keeps safe from caring infections from surfaces. Hot pavement becomes very uncomfortable for dogs walking and salted roads in the winter can potentially hurt even tough paw pads. So, having a stroller can be the best alternative to face these situations. Larger breeds need more exercise for proper physical fitness. If the dog becomes injured suddenly during running or playing, then a stroller may help you to carry him for taking necessary action. Sometimes small breeds can’t keep up with larger or humans when jogging for long distance. Then small dog strollers can give him a ride when gets tired. A stroller can be the most comfortable vehicle for your pooch to travel. Walking can become very easier with a stroller. Dog owners also feel happy to take their loving pooches while going out for short times. From the inside of the stroller, the pet can observe the whole scenario of the roadside and enjoy the journey. There is a separate portion includes with the stroller where you can put all essential elements of your pooch to serve timely. Dog strollers are a great invention to take your pooch with you on walks, jogging, shopping, exercise session or workout short. Pet proprietors love the variety of features and becoming dependent on it day by day for its incredible facilities. It is important to analyze the overall features when you come to finalize any model. Our detailed product features and buying guide provide you sufficient knowledge to make it short your thinking and finalize the decision with the most suitable product. Your knowledge makes you more confident to ensure the right choice and fulfill the needs you have. Question: Why does dogs need a stroller? Answer: There are many reasons a dog could need a stroller. If the dog is elderly and has bad joints or recovering from an injury then a stroller could sincerely help him. On the other hand, small dogs could not keep up with you at jogging time. 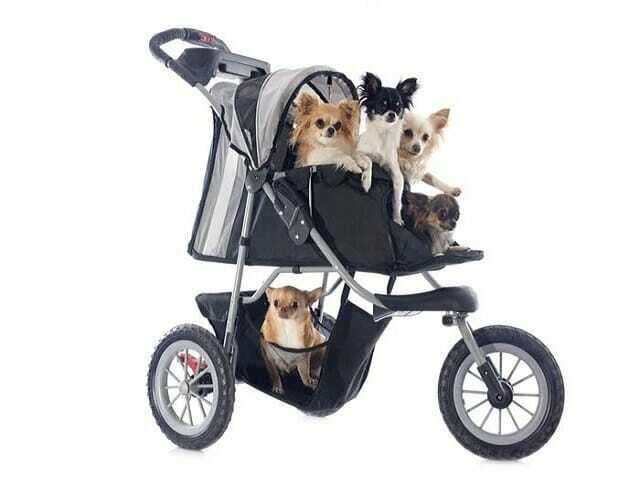 Dog stroller also protects your dogs from hot pavements, extreme sunshine or heavy rain. Question: Are three wheels dog stroller better than four? Answer: Actually, it depends on where you like to use the stroller. Three wheels strollers are better for running where the four-wheeled option is more practical for day to day use. Question: Do all dog strollers have inherent harnesses? Answer: Most of the stroller comes with a fastening clip so that you can attach the dog leash to avoid any accidents. Otherwise, you can also choose a stroller with the inbuilt harness if necessary. Question: Do the strollers come with rain covers? Answer: No, not all the stroller has rain covers with its design. But, you may check the individual item when choosing. 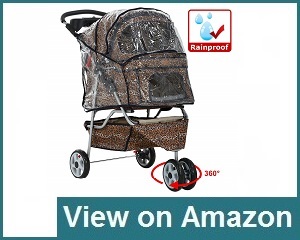 Otherwise, you can add a rain cover with the stroller by purchasing separately. Question: Does the stroller suitable for larger dogs? Answer: Basically, it depends on your dog’s size or weight and the capability of the stroller. How much its size and can hold up. Always check the stroller is the best suit with your dog’s size. Excellent stroller for our Maltese, air tires provide the smoothest ride, easy to assemble, couldn’t beat the price. It also came with the pad and rain cover. No issues out of the box. After reading the few neg reviews here and on other web sites, decided to add some straps for added support/stability. They don’t interfere with folding, makes the bottom of the compartment stable, will prevent seams ripping, bolts poking through. The Velcro fasteners underneath don’t have to be used, easier folding and unfolding. 2.00 ea. for the straps @ wally world (camping area). She loves to ride in it, little big when folded, 28 lbs or so, but a quality stroller.